Bell MTS Place comes alive on Friday with the “We are Canada!” opening ceremonies. The ceremony marks the 50th year of amateur sport at the Canada Games as well as Canada’s 150th anniversary, so it’s going to be HUGE. Hundreds of performers will make their way onto the stage, as well as feature sport celebrities and Canada Games alumni. Music headliners include Serena Ryder, Coeur de Pirate and The Bros. Landreth, who will perform with a youth chorus from StudioWorks and dancers in collaboration with Canada’s Royal Winnipeg Ballet. When the games come to a close, head to Investors Group Field to celebrate the achievements of Canada’s young athletes and pass the torch to the 2019 Canada Winter Games in Red Deer, Alberta. With the theme “Grand Summer Party”, the Closing Ceremony will show off the natural beauty of the province and feature Fred Penner, Sierra Noble and Brett Kissel. Celebrate the many facets of Canadian culture at the Manitoba Liquor & Lotteries Canada Games Festival. Enjoy family-friendly activities (you don’t want to miss the Icelandic games) and music by a variety of Canadian artists such as Kardinal Offishall, Serena Ryder, Coeur de Pirate and more. Oh, and did we mention all of this is completely FREE? If you find yourself in Gimli for the sailing events, drop into the New Iceland Heritage Museum to see a stunning photography exhibit by artist Linda Vermeulen. The exhibit tells the story of 10 years sailing on Lake Winnipeg, with a serious love for the water. FortWhyte Alive is not only the site of the Bison Butte Mountain Bike Course, it’s also host to the Canada Games Family Photo Hunt. In the spirit of the games, the Dalnavert Museum is hosting a special exhibit featuring sports equipment, attire, tools and more between the years of 1890 and 1930. The perfect activity for sports lovers and history buffs alike! Test an array of designs in the Paper Plane Factory, customize your plan and take part in a hanger-wide Flags of Canada Scavenger Hunt. 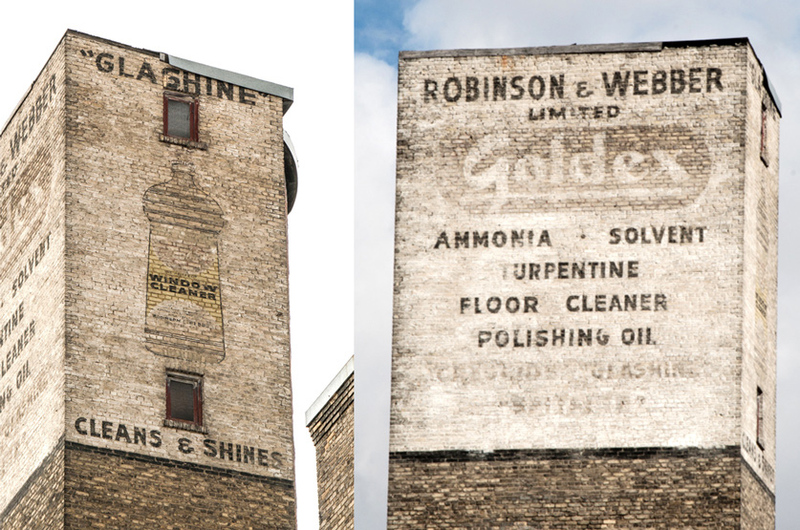 Want to see the faded signs in Winnipeg’s historic Exchange District as they once were? See our capital city in a whole new light at Painted by Light, a one-night art and heritage event that will see five of our ghost signs illuminated back to their former glory by Portland-based experiential designer Craig Winslow. How do you Fringe? Do you colour outside the lines? Are eccentricities your idea of normal? And idiosyncrasies things of fascination? Then you have a full week and then some to live life on the edge at the Winnipeg Fringe Theatre Festival. Now in its 30th year, the Fringe Festival welcomes all to witness the talents of musicians, acrobats, and other unique performances, with events for all ages. Photos by Chris P. Bakon and Amy Zinn. After three incredibly successful years, it’s no surprise that Real Love Summer Fest is back again. With a growing fan base, this three-day music extravaganza has secured a new location in Teulon, Manitoba, with promises of beautiful scenery and shaded camping in the forest. This summer, watch performances by acts such as Widowspeak and The Radiation Flowers, wander through art installations from local artists and take in the experience that is Real Love. Some of the most diverse and exciting young performers are on route to Manitoba to take audiences on a quest to find hope and chase dreams. The Dream Catchers is a musical that blends hip hop, spoken word and folk and combines it with Indigenous and contemporary dance in a performance that explores the dreams of young Canadians. The Dream Catchers is a Canada150 Signature project and will make stops at the Canadian Museum for Human Rights in Winnipeg on July 26, Pinawa’s Community Centre on July 27, Winkler’s Concert Hall on July 28 and the International Peace Garden in Boissevain on July 29. The Gimli Glider Exhibit preserves the history of the famous Gimli Glider that was landed successfully on July 23rd, 1983 without fuel or controls. The gallery focuses on the pieces, memorabilia and aircraft parts from Guan 604, including the BMX bikes of the boys who watched the plane come down, a full scale Gimli Glider cockpit mockup (with a computer generated simulator of a landing experience) and a 3 window panel fuselage section from the original plane. Watch a variety of stories and films about the event from the comfort of a real Boeing seat in the gallery theatre and get to know more about this iconic moment in Gimli’s history. What’s on the menu for dinner? On this mouth-watering food tour, you’ll head out in the West End of Winnipeg to explore some of Winnipeg’s favourite eateries. Start with Pho Kim Tuong before heading to India Palace, De Luca’s and Jonnie’s Sticky Buns. Be exposed to the grace, beauty and artistry of classical ballet and modern dance at Ballet in the Park. This year’s FREE event will feature a special performance of the Royal Winnipeg Ballet Company Dancers (TBA) as well as a pas de trois performance of The Fairy Doll by RWB School Professional Division students and a Grease medley by the Recreational Division students. Hot sand, cool water and bare feet are an unbeatable combination. Every Manitoban has a favourite go-to beach, but with a province that boasts over 100,000 lakes, there are so many new ones for you to discover and enjoy. And you’re in luck because Buzzfeed posted a list of 14 Manitoba beaches you must explore this summer. What’s more fun than a party at the beach? How about two parties only 3o minutes away from each other? This weekend, Winnipeg Beach hosts their classic Boardwalk Days featuring a BIG midway, outdoor markets, pancake breakfast, parade and fireworks.